Summer just got a lot cooler for young children in Panorama City and surrounding communities. No, the temperature isn’t going down. Instead, kids are going up, over, around and through a cool, new state-of-the-art playground funded by First 5 LA that is designed to include children with special needs. 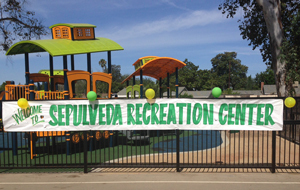 The grand opening of the new playground at the Sepulveda Recreation Center was complemented by a summer get-together and resource fair called “Learn, Play, Grow,” held by the Best Start Panorama City & Neighbors Community Partnership. In 14 communities throughout Los Angeles County, First 5 LA’s Best Start program brings together parents and caregivers, residents, organizations, businesses, government institutions and other stakeholders to collectively build a vision and develop strategies to create the best possible community for young children and their families. More than 100 participants at the July 11 event were treated to educational booths, free giveaways and the opportunity to interact with several important organizations. The Panorama City Branch of the Los Angeles Public Library was on hand, offering sign-ups for parents looking to expand their reading resources. El Nido Family Centers – which provides counseling and family support services to disadvantaged communities throughout L.A. County – had a prominent presence as well, with brochures and packets about childhood development. Younger guests had their own special activity booths, focused on dough making, coloring games and soil planting. But, of course, the biggest draw was the playground itself. What makes it particularly unique is its “inclusive” design, which can specifically accommodate children with special needs. Shane’s Inspiration, which creates social inclusion for children with disabilities through the creation of inclusive playgrounds and programs, partnered with the community on the design of the equipment. The toddler section features a train theme, complete with mock ticket booths, turning wheels and interactive ramps. Across the way is a setup for older kids, featuring large bridges, turnstiles, sliding poles and a fully interactive zip line. The Tot Parks and Trails initiative is a $10 million investment by First 5 LA to create sustainable change by increasing physical activity and promoting healthy lifestyles for children ages 0–5 and their families by increasing the number of places for them to play. Covering 23 cities and neighborhoods throughout Los Angeles County, First 5 LA funds will support 33 projects, including 16 in Best Start communities. With local municipalities overseeing their upkeep, these parks were designed to be sustainable after the Tot Parks and Trails initiative expires on June 30, 2016. Earlier this summer, two other tot parks opened: Lake Castaic Sports Complex in Castaic, and Ruben F. Salazar Park in Los Angeles. So far, 29 tot parks have opened, with four more to go, including City Terrace Park in Los Angeles, which will open September 12. Several other organizations also had a hand in the playground’s creation, Harris said. 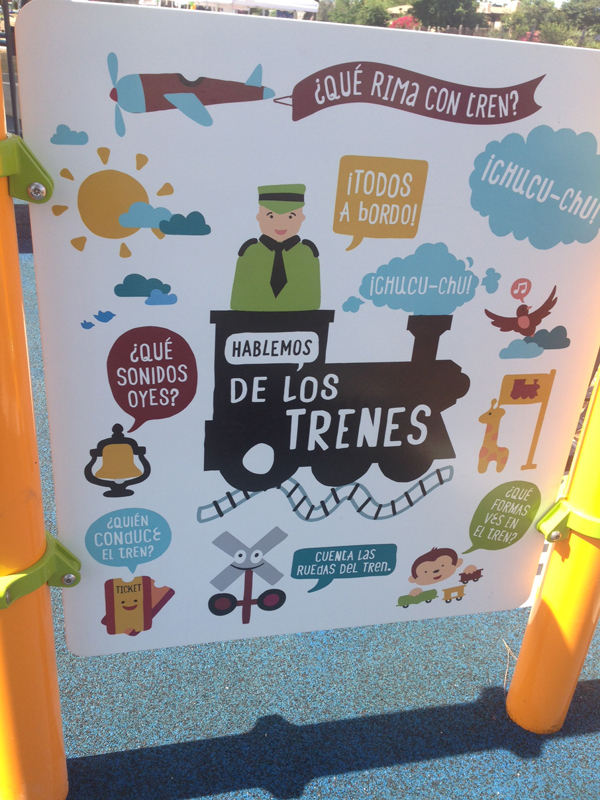 Several members of the Best Start Panorama City & Neighbors partnership were among those community members that had a prominent role in the design of the inclusive playground, contributing creative ideas and design elements, including the train. First 5 LA Program Officer Karen Robertson-Fall echoed that sentiment and also spoke of how the project overcame several challenges. Of course, the children became the ultimate barometer of the playground’s success. And by all accounts, the cheers, smiles and long lines proved it to be a resounding success.